We are pleased to offer hats by Nathaniel Funmaker. Each hat is handmade in Texas. To Nate's knowledge, he is the only Native-American Master Hatter. In 1994 he moved to Southwestern Colorado from Wisconsin and apprenticed under a well-known custom hat and clothing company. After several years of hard work, he became a master hatter. Now in Georgetown, Texas, his shop, Nathaniel's Custom Hatters, creates custom hats of the finest quality. He uses centuries-old techniques that give each hat a timeless quality and style. 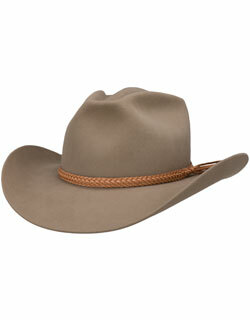 He was named "Best Living Hatmaker" in 2008 by True West magazine. For more information please visit Nate's website at Nathaniel's Hats.